I’ve used sleds on occasion to carry large winter loads. However, the sleds I’ve used have always been home made jobs. I’ve bought kiddie sleds and modified them in various ways to make them serve as ski sleds. My modifications began relatively simply, just drilling holes in the front of the sled and attaching cords to pull with. These simple sleds performed poorly, being next to impossible to control on anything other than level terrain, so I tried more elaborate modifications, using ski pole sections to make solid poles to help control the sled and make it more easy to turn and stop. However, in spite of my best efforts at do-it-yourself modifications, my sleds pretty much sucked. When I needed a sled for a yurt trip this past spring, I decided to buy a commercially built sled specifically designed for use by a skier. After doing a bit of internet research, I decided on a sled by the Ski Pulk company. The sled I bought was the Paris Backcountry Sled with Split Poles. After dragging this sled uphill for miles, and skiing with it on downhill for more miles, I have to say that I’ve been very happy with it. It’s worlds better than my home made jobs. The first thing I noticed are the poles. I bought poles that break down into two pieces, which makes the poles more compact when disassembled. The poles screw together neatly and securely, and there is no slop in the threads. The attachment points from the poles to the sled are also very secure. The poles flex a bit, which adds to the comfort, but are rigid enough to provide for good steerability. The sled also comes with a set of fins that provides better tracking on steep terrain. They are easily removable, and can be screwed inverted in the bowl of the sled when not in use. If you decide you need them, it takes less than 5 minutes to unfasten them, move them under the sled, and screw them in deployed mode. An optional duffel bag is available, but I just used one of my own. The sled comes with straps and buckles so you can strap your stuff down securely in the sled. In use, the sled pulls well, with excellent control. 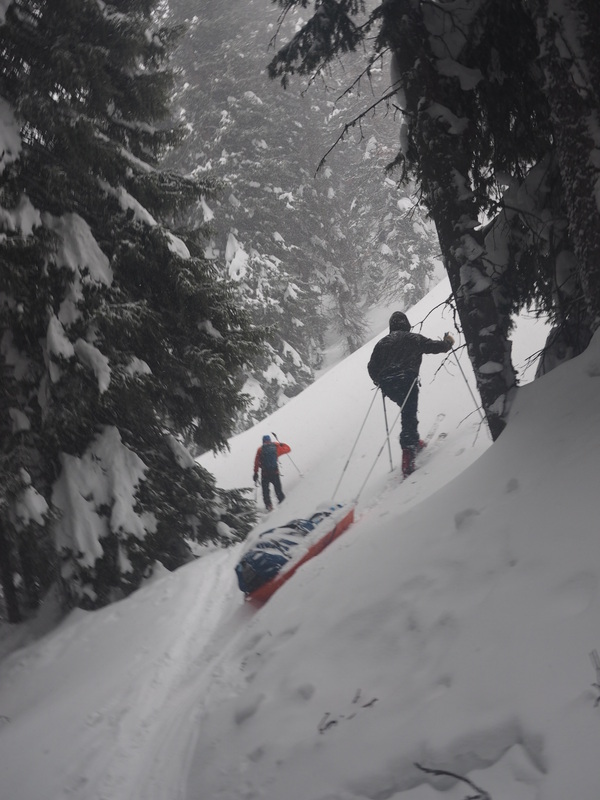 I used the Ski Pulk on an approach to a backcountry yurt followed a steep, narrow, winding path. Going up in fresh snow was not a problem, even when loaded with 50-60 pounds. Much more surprising and impressive was the sled’s downhill performance. On hard snow, going down a path that resembled a bobsled run lined with trees was surprisingly easy. The sled handles very well. The slight flex in the poles helps to cushion dramatic turns, aiding balance, but the poles have enough stiffness to allow for radical changes of direction when needed. On easy, open slopes, I could ski fun turns, and the sled just followed obediently behind me, hardly interfering at all. Overall, I’m very pleased with the Ski Pulk sled. After using this thoughfully designed and well built sled, there’s no way I will ever consider using a home built sled again. 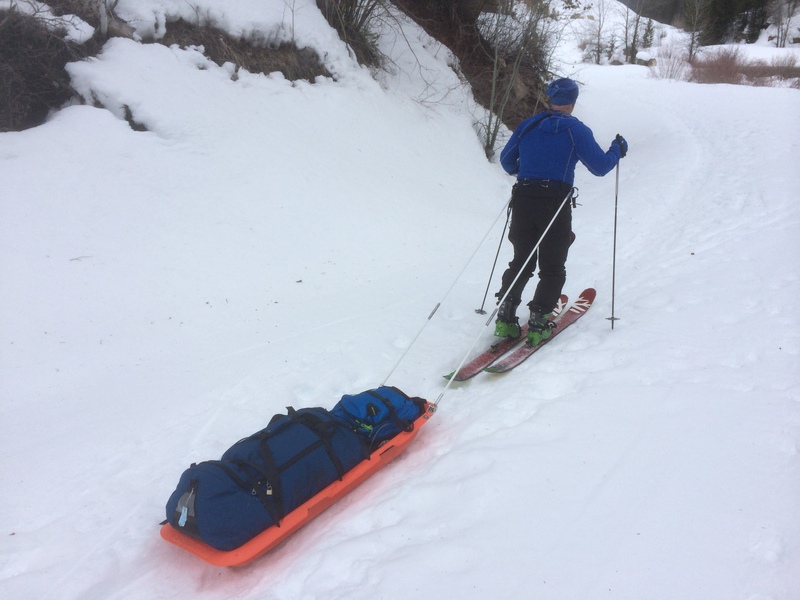 This entry was posted in Backcountry Gear Reviews, Ski Reviews and tagged backcountry ski, mediocre mountaineering, Ski Pulk, ski pulk review, ski sled by Kai. Bookmark the permalink. I have found scaffold scissors (crosspiece from collapsible painting scaffold sets) to be the best poles they are 7′ long extremely rigid, bolted at the center, and have perfect carabiner holes. Not to mention they can be used as is no cutting just some fitting, and I have found them in junkyards or on c-list for free that’s $0.00. Worth a look!